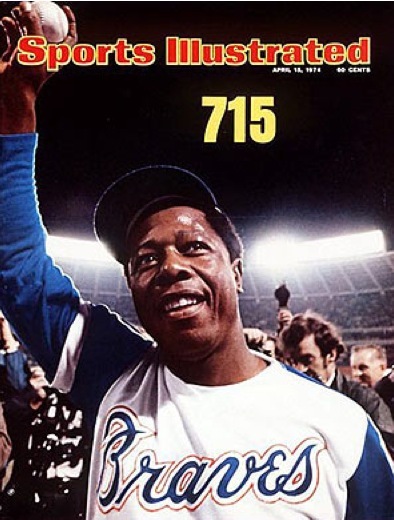 Today is the exact 39 year anniversary of Hank Aaron’s 715th career home run, which of course, broke the long standing career home run record held by Babe Ruth. It was a Monday night, April 8, 1974. The game between Aaron’s Atlanta Braves and the Los Angeles Dodgers was nationally televised. There certainly was no MLB Network back then and I remember being happy that Aaron hit the record breaking home run in a game that was televised. Two years before he became United States President, Jimmy Carter was in attendance. Dodgers’ left fielder, Bill Buckner, who amassed over 2700 hits in his career, made a valiant, albeit futile leap at the fence for the Aaron home run. Dusty Baker was the next hitter after Aaron, and also hit a home run. Aaron was great and a true favorite. It was a remarkable achievement on Hank’s part to break the hallowed record. He endured horrible things that leave a shameful mark on so much that is perceived as good. Time and research have yielded the fact that there was only one Babe Ruth. He was the best of the best. Ruth would have received my vote as the best sport’s figure of the prior century. It is too bad that time separated Ruth and Aaron playing together, but alas in that other time that would not have been possible.